What better than a little zestiness to brighten up the COLDEST WEEK IN THE HISTORY OF WEEKS EVER!? Okay, so maybe that's not exactly true...but it was definitely close. We've been blessed with a not-so-cold winter thus far, so a chill was bound to happen. Hitting the teens and "real-feel" singular/negative temperatures definitely did not bode well on most of the population, to say the least. Except maybe people that had snow days...or "cold" days. I didn't even know that was a thing! Regardless, it's been a while since I've had scallops...and the scallops at the market were looking mighty fine! Freshly shucked - sadly not in the shell still - but I quickly got over that. Scallops and a nice head of cauliflower. What to do?! With me new Vitamix giving me longing looks on the counter, I knew I had to make a cauliflower puree - which is probably one of the simplest sides to make ever - RIDICULOUSLY healthy, and crazily easy. So why not pair the two together? The following recipe is a quick change from the usual scallop flavor combination, but definitely does not disappoint. I served it at a recent dinner party, and everyone raved (and was sad there weren't more scallops!). As much as it may sound fancy, it's super easy to make. Give it a try and impress your friends! 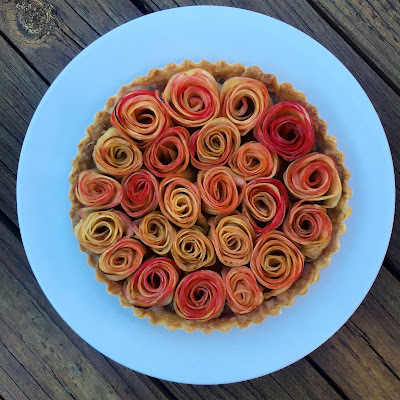 Before you get to steaming, make your roasted florets. Break up a couple of florets into mini florets for roasting and as a garnish for the final dish. Preheat the oven to 400F, toss the mini (micro?) florets with an ample amount of olive oil, salt, and pepper, and roast until dark brown and crispy. Now, onto the puree! 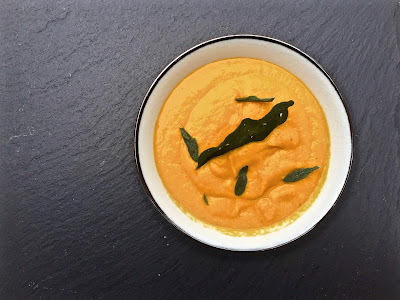 This puree recipe is not a lie. Cauliflower. Fire. Water. The cauliflower needs to be steamed, so utilize whatever stove top item you have, whether its a bamboo steamer or regular steamer insert. If you must, the cauliflower can be boiled. Bring a couple cups worth of water to a boil, making sure that the water isn't touching the bottom of the steamer. When it has come to a boil, lower the heat to an aggressive simmer, and place the florets into the steamer. Cook until tender! Time will vary depending on the size of your florets - so taste occasionally, starting after about 5 or 6 minutes. When tender, remove from heat and toss into a blender or food processor. Pulse the florets, and slowly pour about 1/4 cup of the steaming liquid into the blender. Continue to add the water until the puree has a smooth, velvety texture, about the consistency of a vichyssoise. That's probably a horrible example - the consistency of the best, creamiest mashed potatoes you've ever had! Add salt and pepper to taste, and set aside. Don't forget to keep an eye on your roasting cauliflower! Gastriques are easy, but it sounds fancy and difficult, right? Fortunately, that is not the case! A gastrique is basically a sugar/vinegar reduction that can be flavored any way you like. Lime was my juice this time around! A gastrique also can be made by caramelizing the sugar first, adding a few more steps, but this process is a lot easier! Place all of your ingredients to a boil, stir, lower the heat to a simmer, and let reduce until it has reached a thick, syrupy consistency, about 10-12 minutes. The sauce should be drizzle-able - not too thin, but not so thick that its globby. Remove from heat, place in another container and set aside. To finish the dish, get ready to sear your scallops! Warm up the cauliflower puree, and have all of the other components ready to go. First, make sure that the foot/adductor muscle of the scallop is removed. It looks like an extra piece of meat about the size of a thick quarter on the side of each scallop - just pull it off with your fingers. Salt and pepper both sides of your scallop. Preheat a large saute pan over high heat until super hot! Add olive oil or grapeseed oil (make sure if you use olive oil that it doesn't smoke). When the oil is shimmering, add in the scallops, being sure not to overcrowd them. Cook the scallops until golden brown on each side, about a minute and a half. Remove from heat onto a paper towel. On a plate, spoon out about 1/4 cup of cauliflower puree as a base. Place three scallops on each plate, however you like - stacked, in a line, you name it. Scatter roasted micro florets around each plate, and finish with a solid, hefty drizzle of lime gastrique. Beware, this lime gastrique is DELICIOUS. Finish by zesting a lime over the scallops. Dig in! As I said before, this is a pleaser all around! You get all of the textures and flavor profiles you need in this dish - velvety, crunchy, sweet, sour...it's all there. The puree is absolutely addicting, and I suggest making it whenever you're bored (naturally). If you are lucky enough to have a super-powered blender like a Vitamix, you'll get a light, airy, super velvety texture that is hard to beat! It tastes like there's butter and cream in the mix, but alas, there is none. This combined with the sweetness of the scallops, and the golden crunch action of roasted cauliflower gets the party started. Honestly, you could stop here and the dish would still be undeniably great - but why stop when you can take it to the next level? The gastrique and fresh lime zest brighten this dish up like a ray of sunshine coming through the clouds on an overcast day. Seriously. Not to mention, the aroma given off by the fresh lime zest when the plate is put down gets you ready for the party that is about to occur in your mouth. My new favorite trifecta: scallops, cauliflower, and lime. Whip it up!